Which Idlis and Dosas are heathy? The prefect breakfast snack. 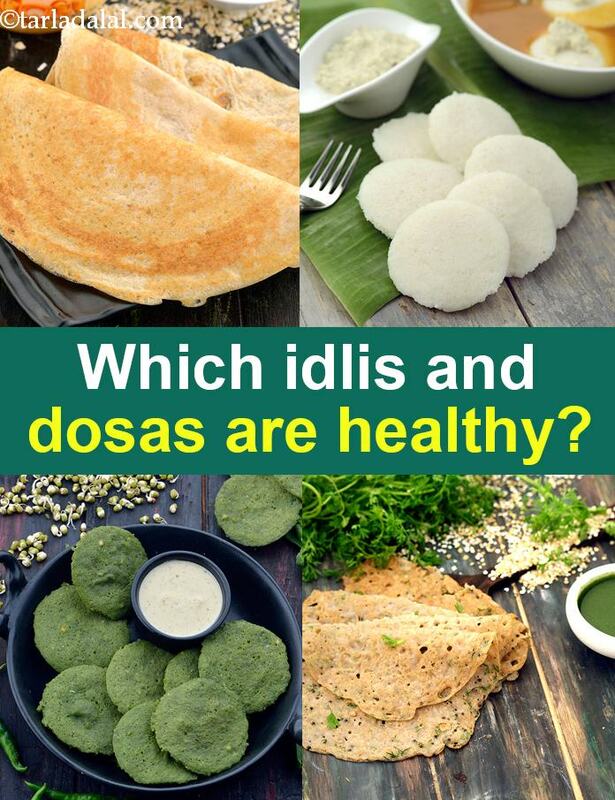 Which Idlis and Dosas are heathy? healthy idli recipes. healthy dosa recipes. the prefect breakfast snack. Evergreen South Indian delicacies like idlis, dosas and appams are now popular all over the world! And with good reasons too - they are healthy, tasty, quick and unbelievably versatile. There is no end to the variants you can prepare, reinforced with varied grains, vegetables, greens, sprouts, and a horde of other healthy ingredients. Moreover, when you have the batter ready on hand, it takes very little time and effort to make these delicious snacks. Indeed, what a delightful and nutritious way to start your day. Just ensure that when making dosas, you use minimal oil, to improve the health factor. top 10 healthy dosa recipes. See that at number 9 is brown rice dosa. But the big surprise is the most popular dosa in India, called dosa or sada dosa is at number 10. While sada dosa is healthy, it has rice in it and hence it stays at the bottom of the pile. What we want to show you is to use healthy ingredients like buckwheat, dals, oats, ragi, barley and quinoa in your daily cooking as they are superior food quality to rice. Read below to understand why. top 10 healthy dosa recipes below. top 6 healthy idli recipes. But the big surprise is the most popular idli in India, called idli or plain idli is at number 6 or last. While idli is healthy, it has rice in it and hence it stays at the bottom of the pile. What we want to show you is to use healthy ingredients like buckwheat, dals, oats, ragi, barley and quinoa in your daily cooking as they are superior food quality to rice. Read below to understand why. top 6 healthy idli recipes below. See why buckwheat? are perfect for healthy idlis and healthy dosas. Buckwheat is a very good source of Iron and good to prevent anaemia. Rich in folate and good food for pregnant women. Buckwheat keeps your heart healthy and high in fibre and diabetic friendly. Buckwheat is a rich plant based source of protein and excellent option for Vegetarians. If your vegetarian, this is the perfect source of protein and this buckwheat dosa is cooked every week in my house and way healthier than the classic dosa recipe and read why is dosa healthy to understand the subtle difference between usage of rice and dropping it. See why oats are perfect for healthy idlis and healthy dosas. Oats are a great source of protein for Vegetarians. It is rich in soluble fibre, which helps lower blood LDL cholesterol, the so-called "Bad" cholesterol. Whole Oats have an antioxidant called Avenanthramide (a polyphenol from oats) which helps lower blood pressure levels. Enjoy our gluten free fibre rich oats dosa recipe. A good variation to this is the oats mutter dosa recipe. NOTE that oats idli is way superior to our traditonal idli recipe as you need to read is idli healthy to understand the subtle difference between usage of rice and dropping it. The oats idli recipe is made with a bit of urad dal and ZERO rice. See why ragi, nachni are perfect for healthy idlis and healthy dosas. Ragi flour is high in protein and great source for vegetarians. In addition its gluten free, high in fiber which in turn is good for diabetics and a healthy heart. Nachni dosa recipe is made with urad dal to make it a very healthy breakfast recipe. An even healthier option is to use whole nachni and soak it to make ragi dosa with whole nachni recipe. See why barley is perfect for healthy idlis and healthy dosas. Barley is diabetic and pregnancy friendly. A high fiber diet for years has been paired with reduced risk of heart disease. The fiber (2.73 g) from barley helps reduce blood cholesterol levels. Enjoy this mysore barley dosa recipe made with urad dal. There is also the barley idli which uses par boiled rice. See why yellow moong dal is perfect for healthy idlis and healthy dosas. The fibre (4.1 g in ¼ cup) present in yellow moong dal prevents the deposition of bad cholesterol (LDL) in the arteries which promotes a healthy heart in turn. Packed with nutrients like zinc (1.4 mg), protein (12.2 mg) and iron (1.95 mg), yellow moong dal helps to maintain the elasticity of your skin and help to keep it moist. Try our dal and vegetable idli recipe which has also toovar dal, chana dal and lots of methi in it. Enjoy our healthy idli recipes. healthy dosa recipes and other healthy breakfast articles below.